So there has been something of a cooking drought in the Graphic Foodie kitchen. Holidays, fitting my parents new kitchen, meeting friends and yadda, yadda life. Hopefully, normal service will now resume. I decided to bake these tarallini crackers for my dad's birthday. 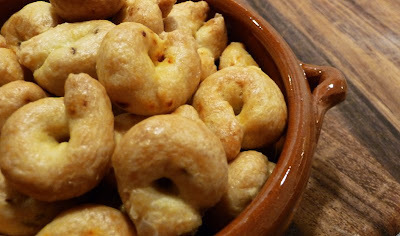 Taralli are a southern Italian snack, kinda like a pretzel, that are commonly served up in bars when you order a drink. You can get them in many flavours but most common are those with fennel, rosemary or poppy seeds. Tarallini are just smaller versions of taralli and I prefer them. They are really crispy and the fact that they are boiled before baking, just like bagels, gives them a really unique texture. Brilliant scattered round in little bowls if you are having a party or BBQ. I decided to halve the dough and flavour one batch with fennel and the other with chili flakes but you can just do one flavour. Be sure to double the fennel or chili if you do and pop it in with the flour at the first stage. Mix the olive oil, salt and flour in a big bowl. Add the white wine gradually until you get a nice solid dough that is smooth and plyable and will not stick. Don't worry if you don't use all of it, you can swig it as you form the rings! Take a small amount in your hands, a ball about 2 cm in diameter, then roll into a sausage. Curl around and press the ends together. I loop them round my fingers but I do have diddy hands. You can make them bigger into taralli with a larger hole in the middle if you wish. You should end up with about 95 tarallini in total, obviously less for the taralli. Pop the tarallini into boiling water about 10 at a time until they float to the surface. Drain onto some kitchen paper (quickly or they'll stick) then pop on a baking sheet lined with baking paper. Bake in a preheated oven at 180°C for 30-40 minutes until they are golden but not too brown. Let them go cold, pour yourself a lovely glass of vino and enjoy your efforts. These will keep in a sealed container for weeks but they are really moorish!